An interactive session with Shri Arjun Ram Meghwal was held on 17th February 2017 at Chennai to discuss various education loan issues. 40 Banks and several social workers participated and interacted with the Minister. During this time, on behalf of ELTF, a background note was circulated. Please read the contents. Education Loan Task Force (ELTF) is one of the three initiatives of the eMagazine PreSense, which is being published for the past 120 months to generate positive vibrations. The eMagazine was initiated in March 2006 when former President of India, Dr APJ Abdul Kalam suggested a medium to promote positivity through communication. Education Loan Task Force (ELTF) was started in 2010 as a social initiative and to create awareness about the Education Loan Schemes of the Indian Banks Association (IBA). ELTF takes up the common grievances with the managements of banks, IBA, the Government of India and also the Parliament. ELTF receives daily feedback through its website, www.eltf.in. ELTF has so far provided clarifications to more than 18,000 students/parents. Around 3,000 grievances have been forwarded to the managements of banks for investigation and settlement. · Lack of awareness among the branch officials and students on the IBA Scheme. The IBA guidelines are not followed. · Banks are not aware that the Service Area Concept is not applicable for Education Loans. They follow it in violation of the RBI guidelines. Students are therefore shunted from branch to branch, and processing of applications takes a long time. · Students do not get proper guidance and treatment during the application stage. · The Vidyalakshmi Portal www.vidyalakshmi.co.in, launched by Hon’ble Finance Minister in 2015 is still not popular. · Banks do not claim interest subsidy properly, in spite of the facility of technology. For this reason, many eligible poor students have been denied interest subsidy. · Although the Government of India promises 100% Interest Subsidy during the moratorium period, in reality only around 25-30% of the claimed amount is reimbursed. · At present, only students from the Minority Section of the society are eligible for Interest Subsidy for foreign studies. It should be extended to all eligible students from economically weaker background. · Interest Subsidy is given only for Professional and Technical courses studied after the 12th Standard. This should be considered for vocational courses, which many poor students take up, after completing the 10th standard. 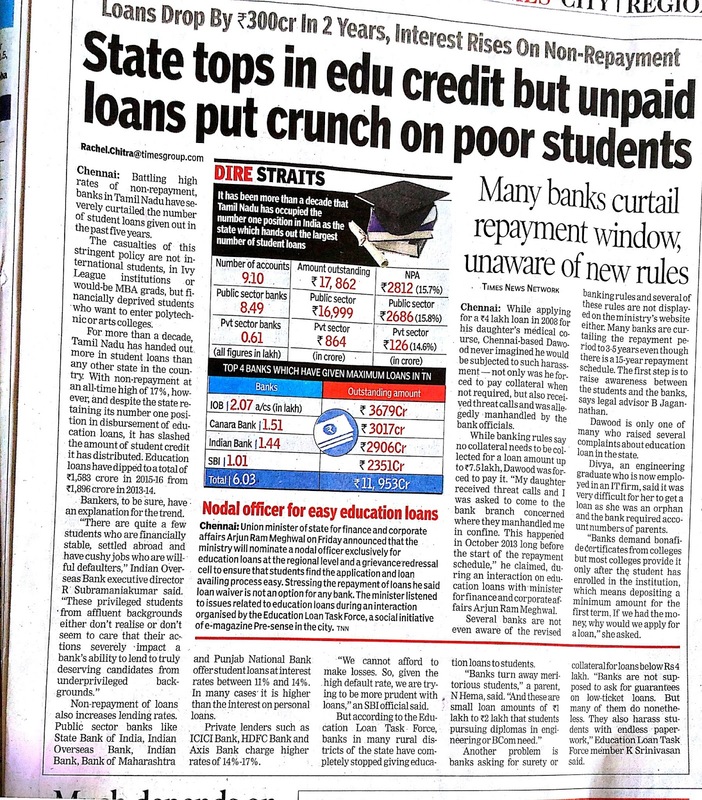 · Even after the release of subsidy by the Government, banks have been reported to withhold the reimbursed subsidy for an unduly long period before releasing it to the loan accounts of students. The students in the meantime, have to pay interest unnecessarily. · It is suggested that instead of the Interest Subsidy Scheme, ‘Interest Free Loan’ can be considered for the moratorium period. · The Government should advise the Comptroller and Audit General (CAG) to audit the banks for ‘Interest Subsidy’ management. · Many bank branches insist on security for even those loans that are less than Rs.7.50 lakhs, which are covered under the Credit Guarantee Scheme. · Branches demand payment of interest during the study period as a pre-condition for disbursement of the next instalment. · Branches do not provide proper clarifications about the loan accounts. Students therefore write to the ELTF for clarifications, which the branches should have given in the first place. · Although the IBA Scheme allows 15 years of repayment (with telescopic repayment) after completion of study and a one-year moratorium period, many banks pressurise the students to repay the loans in 3-5 years. A proper repayment schedule is not provided to the students. · An additional moratorium period of 6 months, two or three times, is not provided by the banks. The students get into a debt trap and their credit rating suffers. · There is no proper communication between the students and the branches after disbursement of the loan. · Due to improper adherence to the IBA guidelines by banks and also due to the short receipt of interest subsidy, the overdue interest is added to the principal loan account, and it is classified as Non-Performing Asset (NPA). · Some of the banks hand over the loan accounts to Private Agencies (ARCs) who harass the students to recover the loans. Banks seem willing to pay more to ARCs, instead of extending legitimate concessions to the students. · Some banks harass the students over small overdues, by displaying their photos prominently in public places. Some students have committed suicide due to such harassment by banks and ARCs. Recently, NHRC fined one bank over such harassment. · If the existing NPAs get rescheduled properly with a proper repayment schedule, the NPA level can be reduced to 20% of the existing level. · The Government should ensure 100% reimbursement of Interest Subsidy. The amount not paid by the Government should not be included as NPA of the student. · A new Institution to provide refinance for all Education Loans should be set up, in the lines of NABARD and SIDBI. · Rate of interest should be reduced to a minimum level. · A high level committee should be set up with all stakeholders to examine the present education loan and interest subsidy management. · IBA and Banks should take interest in creating awareness among the students and branch officials. Banks should hold periodical meetings with student borrowers. · There should be a Nodal Officer to redress the grievances at the Regional Offices and Head Offices of all banks, RBI and the Ministry of Finance. · Banks should stop handing over the loans to Private Agencies, and harassing the students. Instead they should adopt legal methods for recovery. · Banks should follow IBA / RBI guidelines scrupulously. Instead of distancing the students from the Bank, they should motivate them through regular communication and interaction. At National level, share of outstanding Education loan over Gross Bank credit is getting reduced year by year. While at National level, disbursements of Education Loans has gone up in 2015-16 as compared to previous years, it has come down in Tamil Nadu. (Please note it is disbursement and not outstanding balance). In spite of this, the share of Education loans over Gross Bank Credit has come down. Stand-Up India Scheme facilitates bank loans between Rs.10 lakh and Rs.1 Crore to at least one Scheduled Caste (SC) or Scheduled Tribe (ST) borrower and at least one woman borrower per bank branch for setting up a greenfield enterprise. This enterprise may be in the manufacturing, services or trading sector. In case of non-individual enterprises, at least 51% of the shareholding and controlling stake should be held by either an SC/ST or woman entrepreneur. This Scheme will benefit 2.5 lakh entrepreneurs through 1.25 lakh bank branches across the country. The total number of commercial bank branches in Tamil Nadu is 10,259. In Tamil Nadu as at November 2016, an amount of Rs.145.47 crores is outstanding in 888 loan accounts. The target for 10,259 branches in Tamil Nadu is 20,518 accounts.